On 12 May 2014, the selection panel of the competition, chaired by Erik Orsenna , gave awards to five of the 100 finalists chosen earlier by the members of the Cercle des économistes. 1st row: André Cartapanis, Cercle des écobomistes, Erik Orsenna, de l’Académie française and President of the selection panel, Antoine Reverchon, Le Monde. 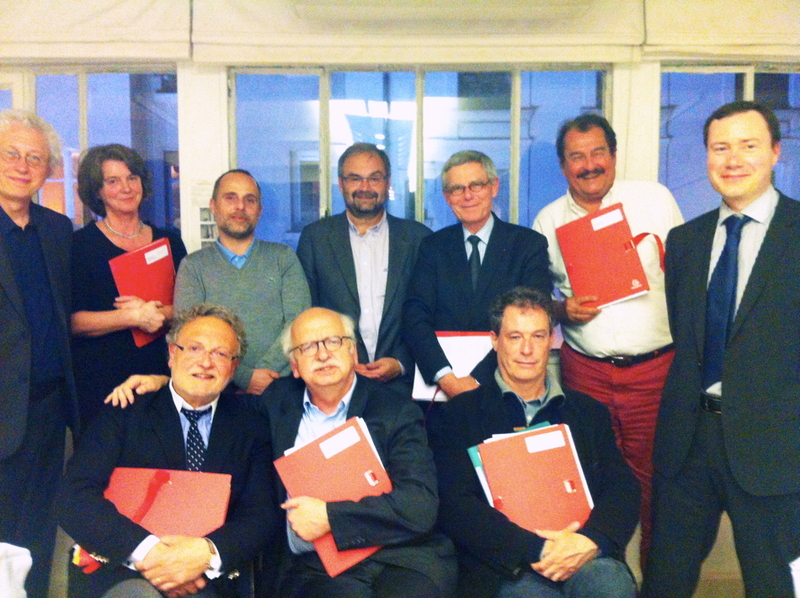 2nd row: Bernard Foccroulle, Director of the Aix Festival, Virginie Clayssen, Advisor to Alain Kouck, President of Editis, Vincent Lemerre, France Culture, , François Chérèque, President of l’Agence du Service Civique, Jacques Biot, President of Polytechnique , Bruno Raffaelli, Member of La Comédie Française and Hippolyte d’Albis, Cercle des économistes. Investing in one’s self for investment in the future Investing in the future is not the exclusive responsibility of a handful of «decision-makers»: rather, it concerns us all. The first step for investing in the future is to get involved in politics without necessarily becoming a politician: we should all become well-informed and take part in debating public issues today so that we can be up to the task of constructing the future of tomorrow! Budgetary federalism in the service of Europe Minutes of an imaginary meeting of a new European institution with the task of evaluating the degree to which a federated Europe can respond to a world crisis shaking up global commerce in 2013. We offer a rough outline for a strong and autonomous Europe, able to undertake budgetary, fiscal and monetary structural reforms. Let’s invest in shared mobility Seen through the lens of our experience in organizing passenger transportation for travelers, we offer our vision for a long-lasting form of mobility. Can we envisage a civilized policy with the potential of freeing us from our dependence on private cars for transportation? Are we capable of investing to create a better life by looking beyond the automobile for transportation alternatives? Download the list of the 100 students (PDF).